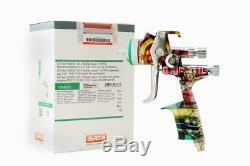 SATA JET 5000 B HVLP - SPRAYGUN FOR PROFESSIONAL PAINTING. SPRAYGUN SATA JET 5000 HVLP. The flagship model SATAjet 5000 B sets new standards of quality. Spreading becomes even easier and safer. The flexibility offered by this high performance spray gun, with regard to application distance and inlet pressure, opens up new perspectives. Painters can adjust the pressure and distance based on the paint to be applied, the climatic conditions and their working style - achieving perfect results. Ergonomics at the highest levels. The design of the SATAjet5000 B was developed by a team of experts from the Porsche Design Studio who, in collaboration with SATA specialists, transformed pure functionality into an elegant form. Thanks to the particular contour of the handle, this quality pistol fits perfectly with the but no. The handle of the digital model is compact just like the standard model. For this reason the gun is suitable for all painters whatever the size of the hand. The quality of the ergonomic construction is not only shown in the handle, but also in all components such as the adjustment of the oval / round fan and the regulation of the material and also the micrometer of the air. Despite being a sturdy gun that guarantees a long life, its lightness allows you to work comfortably. Optimized concept of projectors for the highest flexibility regarding inlet pressure and application distance. Ergonomic contour of the handle. Pearlchrome surface for easy cleaning, corrosion resistant. Adjustment elements easy to use. Trigger positioned securely - the needle can be mounted simply, safely and quickly. Rotating joint with high-head gasket. A compact shape of the handle. Optimierte Rund- / Breitstrahlregulierung miteiner ½ Drehung. The super-fast SATAjet 5000 B HVLP for maximum working speed with optimized pressure technology and little overspray. Air consumption: 430 Nl / min (15,2 cfm). Recommended entry pressure: 2.0 bar (29psi). Maximum working pressure: 10 bar (145psi). Air connection: G 1/4 a. Contazza riutilizzabile da 0,6 l.
Contazza riutilizzabile in alluminio da 1,0 l. Da0,6 l e misurazione digitale della pressione. Pesosupplementare con versione dotata di articolazione girevole. Ferraris Color è rivenditore ufficiale di prodotti leader di mercato per il mondo carrozzeria, nautica e vernici industriali. Ricerca tra vernice epossidica, poliuretanica, magnetica, pistola a spruzzo e tanti altri prodotti. CONTATTACI PER INFO E CHIARIMENTI. Mozzi 55, 24030 Mozzo BG. The item "Spray Gun SATA JET 5000 HVLP SIXTIES 1.3mm limited edition special with warranty" is in sale since Friday, September 21, 2018. This item is in the category "Auto e moto\ ricambi e accessori\Garage\ utensili e prodotti\Utensili ad aria compressa\Pistole a spruzzo". The seller is "ferrariscolor" and is located in mozzo, BG.